What if a sender won’t support DKIM/DMARC? parsedmarc is a Python module and CLI utility for parsing DMARC reports. When used with Elasticsearch and Kibana (or Splunk), it works as a self-hosted open source alternative to commercial DMARC report processing services such as Agari Brand Protection, Dmarcian, OnDMARC, ProofPoint Email Fraud Defense, and Valimail. If you are looking for SPF and DMARC record validation and parsing, check out the sister project, checkdmarc. DMARC protects against domain spoofing, not lookalike domains. for open source lookalike domain monitoring, check out DomainAware. In parsedmarc 6.0.0, most CLI options were moved to a configuration file, described below. Special characters in the username or password must be URL encoded. It is strongly recommended to not use the nameservers setting. By default, parsedmarc uses Cloudflare’s public resolvers, which are much faster and more reliable than Google, Cisco OpenDNS, or even most local resolvers. The nameservers option should only be used if your network blocks DNS requests to outside resolvers. save_aggregate and save_forensic are separate options because you may not want to save forensic reports (also known as failure reports) to your Elasticsearch instance, particularly if you are in a highly-regulated industry that handles sensitive data, such as healthcare or finance. If your legitimate outgoing email fails DMARC, it is possible that email may appear later in a forensic report. Forensic reports contain the original headers of an email that failed a DMARC check, and sometimes may also include the full message body, depending on the policy of the reporting organization. Most reporting organizations do not send forensic reports of any kind for privacy reasons. While aggregate DMARC reports are sent at least daily, it is normal to receive very few forensic reports. An alternative approach is to still collect forensic/failure/ruf reports in your DMARC inbox, but run parsedmarc with save_forensic = True manually on a separate IMAP folder (using the reports_folder option), after you have manually moved known samples you want to save to that folder (e.g. malicious samples and non-sensitive legitimate samples). Here are the results from parsing the example report from the dmarc.org wiki. It’s actually an older draft of the the 1.0 report schema standardized in RFC 7480 Appendix C. This draft schema is still in wide use. parsedmarc produces consistent, normalized output, regardless of the report schema. Thanks to Github user xennn for the anonymized forensic report email sample. parsedmarc works with Python 3 only. This will set the the proxy up for use system-wide, including for parsedmarc. Windows users should also download a copy of Maxmind’s free GeoLite2-Country.mmdb to C:\GeoIP\GeoLite2-Country.mmdb. On Windows, pip3 is pip, even with Python 3. So on Windows, substitute pip as an administrator in place of sudo pip3, in the above commands. If you would like to test parsedmarc and another report processing solution at the same time, you can have up to two mailto URIs each in the rua and ruf tags in your DMARC record, separated by commas. Some organisations do not allow IMAP, and only support Exchange Web Services (EWS)/Outlook Web Access (OWA). In that case, Davmail will need to be set up as a local EWS/OWA IMAP gateway. It can even work where Modern Auth/multi-factor authentication is required. Extract the zip using the unzip command. Use systemd to run davmail as a service. You must also run the above commands whenever you edit davmail.service. 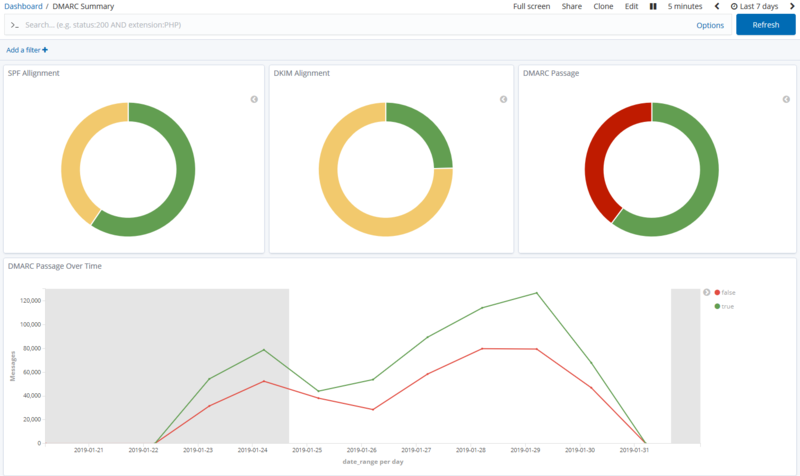 To set up visual dashboards of DMARC data, install Elasticsearch and Kibana. For CentOS, RHEL, and other RPM systems, follow the Elastic RPM guides for Elasticsearch and Kibana. The default JVM heap size for Elasticsearch is very small (1g), which will cause it to crash under a heavy load. To fix this, increase the minimum and maximum JVM heap sizes in /etc/elasticsearch/jvm.options to more reasonable levels, depending on your server’s resources. Make sure the system has at least 2 GB more RAM then the assigned JVM heap size. Always set the minimum and maximum JVM heap sizes to the same value. See https://www.elastic.co/guide/en/elasticsearch/reference/current/heap-size.html for more information. Without the commercial X-Pack or ReadonlyREST products, Kibana does not have any authentication mechanism of its own. You can use nginx as a reverse proxy that provides basic authentication. Fill in the prompts. Watch out for Common Name (e.g. server FQDN or YOUR domain name), which is the IP address or domain name that you will be hosting Kibana on. it is the most important field. Where exampleuser is the name of the user you want to add. Now that Elasticsearch is up and running, use parsedmarc to send data to it. Download (right click the link and click save as) kibana_saved_objects.json. Import kibana_saved_objects.json the Saved Objects tab of the management page of Kibana. It will give you the option to overwrite existing saved dashboards or visualizations, which could be used to restore them if you or someone else breaks them, as there are no permissions/access controls in Kibana without the commercial X-Pack. Starting in version 5.0.0, parsedmarc stores data in a separate index for each day to make it easy to comply with records retention regulations such as GDPR. For fore information, check out the Elastic guide to managing time-based indexes efficiently. Starting in version 4.3.0 parsedmarc supports sending aggregate and/or forensic DMARC data to a Splunk HTTP Event collector (HEC). The project repository contains XML files for premade Splunk dashboards for aggregate and forensic DMARC reports. Copy and paste the contents of each file into a separate Splunk dashboard XML editor. Change all occurrences of index="email" in the XML to match your own index name. The Splunk dashboards display the same content and layout as the Kibana dashboards, although the Kibana dashboards have slightly easier and more flexible filtering options. Use systemd to run parsedmarc as a service and process reports as they arrive. You must also run the above commands whenever you edit parsedmarc.service. The Kibana DMARC dashboards are a human-friendly way to understand the results from incoming DMARC reports. The default dashboard is DMARC Summary. To switch between dashboards, click on the Dashboard link in the left side menu of Kibana. As the name suggests, this dashboard is the best place to start reviewing your aggregate DMARC data. Across the top of the dashboard, three pie charts display the percentage of alignment pass/fail for SPF, DKIM, and DMARC. Clicking on any chart segment will filter for that value. Messages should not be considered malicious just because they failed to pass DMARC; especially if you have just started collecting data. It may be a legitimate service that needs SPF and DKIM configured correctly. Start by filtering the results to only show failed DKIM alignment. While DMARC passes if a message passes SPF or DKIM alignment, only DKIM alignment remains valid when a message is forwarded without changing the from address, which is often caused by a mailbox forwarding rule. This is because DKIM signatures are part of the message headers, whereas SPF relies on SMTP session headers. Underneath the pie charts. you can see graphs of DMARC passage and message disposition over time. Under the graphs you will find the most useful data tables on the dashboard. On the left, there is a list of organizations that are sending you DMARC reports. In the center, there is a list of sending servers grouped by the base domain in their reverse DNS. On the right, there is a list of email from domains, sorted by message volume. By hovering your mouse over a data table value and using the magnifying glass icons, you can filter on our filter out different values. Start by looking at the Message Sources by Reverse DNS table. Find a sender that you recognize, such as an email marketing service, hover over it, and click on the plus (+) magnifying glass icon, to add a filter that only shows results for that sender. Now, look at the Message From Header table to the right. That shows you the domains that a sender is sending as, which might tell you which brand/business is using a particular service. With that information, you can contact them and have them set up DKIM. If you have a lot of B2C customers, you may see a high volume of emails as your domains coming from consumer email services, such as Google/Gmail and Yahoo! This occurs when customers have mailbox rules in place that forward emails from an old account to a new account, which is why DKIM authentication is so important, as mentioned earlier. Similar patterns may be observed with businesses who send from reverse DNS addressees of parent, subsidiary, and outdated brands. Further down the dashboard, you can filter by source country or source IP address. Tables showing SPF and DKIM alignment details are located under the IP address table. Previously, the alignment tables were included in a separate dashboard called DMARC Alignment Failures. That dashboard has been consolidated into the DMARC Summary dashboard. To view failures only, use the pie chart. Any other filters work the same way. You can also add your own custom temporary filters by clicking on Add Filter at the upper right of the page. The DMARC Forensic Samples dashboard contains information on DMARC forensic reports (also known as failure reports or ruf reports). These reports contain samples of emails that have failed to pass DMARC. Most recipients do not send forensic/failure/ruf reports at all to avoid privacy leaks. Some recipients (notably Chinese webmail services) will only supply the headers of sample emails. Very few provide the entire email. DMARC ensures that SPF and DKM authentication mechanisms actually authenticate against the same domain that the end user sees. A message passes a DMARC check by passing DKIM or SPF, as long as the related indicators are also in alignment. Some vendors don’t know about DMARC yet; ask about SPF and DKIM/email authentication. Check if they can send through your email relays instead of theirs. Do they really need to spoof your domain? Why not use the display name instead? Worst case, have that vendor send email as a specific subdomain of your domain (e.g. noreply@news.example.com), and then create separate SPF and DMARC records on news.example.com, and set p=none in that DMARC record. Do not alter the p or sp values of the DMARC record on the Top-Level Domain (TLD) – that would leave you vulnerable to spoofing of your TLD and/or any subdomain. When you deploy DMARC on your domain, you might find that messages relayed by mailing lists are failing DMARC, most likely because the mailing list is spoofing your from address, and modifying the subject, footer, or other part of the message, thereby breaking the DKIM signature. Modern mail clients and webmail services generate unsubscribe buttons based on these headers. Remove or modify any existing headers from the original message, including From, Date, Subject, etc. In addition to complying with DMARC, this configuration ensures that Reply and Reply All actions work like they would with any email message. Reply replies to the message sender, and Reply All replies to the sender and the list. Even without a subject prefix or body footer, mailing list users can still tell that a message came from the mailing list, because the message was sent to the mailing list post address, and not their email address. Configuration steps for common mailing list platforms are listed below. Where list.example.com the list ID, and en is the language. If a mailing list must go against best practices and modify the message (e.g. to add a required legal footer), the mailing list administrator must configure the list to replace the From address of the message (also known as munging) with the address of the mailing list, so they no longer spoof email addresses with domains protected by DMARC. Message wrapping could be used as the DMARC mitigation action instead. In that case, the original message is added as an attachment to the mailing list message, but that could interfere with inbox searching, or mobile clients. On the other hand, replacing the From address might cause users to accidentally reply to the entire list, when they only intended to reply to the original sender. Choose the option that best fits your community. LISTSERV 16.0-2017a and higher will rewrite the From header for domains that enforce with a DMARC quarantine or reject policy. Some additional steps are needed for Linux hosts. Extracts xml from a zip or gzip file at the given path, file-like object, or bytes. Results are based on a list of public domain suffixes at https://publicsuffix.org/list/public_suffix_list.dat.